By Keith Cowing on May 18, 2007 9:27 AM. 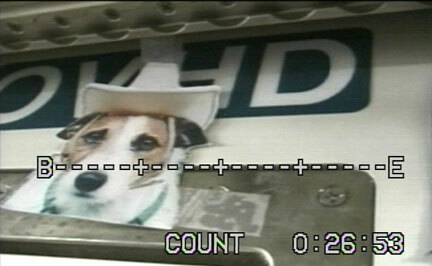 Editor's note: "Flat Gorby is also onboard station, or at least a dog who looks like him. I've attached an image [enlarge] that was a screen capture at the end of test operations for the Capillary Flow Experiments Vane Gap 2 experiment. The test vessels are mounted to the MWA and one of the ISS PD100 camcorders is positioned to record the data. The camera is typically left on after testing is complete, including the "fly around" when it is re-positioned back to the end of the US lab module as one of the end node cameras." Editor's note: \"Flat Gorby is also onboard station, or at least a dog who looks like him. I've attached an image [enlarge] that was a screen capture at the end of test operations for the Capillary Flow Experiments Vane Gap 2 experiment. The test vessels are mounted to the MWA and one of the ISS PD100 camcorders is positioned to record the data. The camera is typically left on after testing is complete, including the \"fly around\" when it is re-positioned back to the end of the US lab module as one of the end node cameras.\"
This page contains a single entry by Keith Cowing published on May 18, 2007 9:27 AM. Today's Ask the Administrator Answer was the previous entry in this blog. New NASA Exploration imagery Online is the next entry in this blog.